Jirga is an Australian film about a soldier returning to Afghanistan that can serve as a paradigm for an understanding of the process of the sacrament of Reconciliation. Source: ACOFB. The film comes from a religious perspective; director and cinematographer Benjamin Gilmour's father was a minister. His first film, Son of Lion – a story of post-9/11 Pakistan – also had a religious point of view. We are told immediately that Jirga means a meeting of council elders. The opening invites its audience into military action. We see a raid on a village with all its dangers and shooting and filmed in green night-light. At the end of the raid, one of the men is shown staring at what has happened, the death. 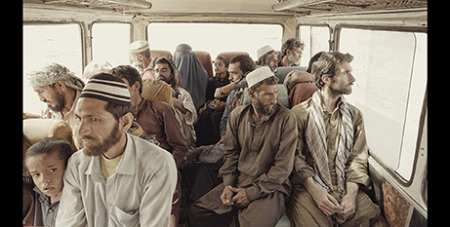 The director knows the landscapes of Afghanistan as well as the city of Kabul. Audiences may well feel as they look at the cityscapes from above, move through the streets and markets into the small hotel, into the shops, that they have been there. However, this is the story of a personal journey of the soldier from the night raid, Mike Wheeler (Sam Smith). It is not clear at first why he left Australia to return to Afghanistan, but eventually it becomes clear that he is on a pilgrimage to go back to the village and confess to the Jirga and for them to decide his fate. For a Catholic watching the film, the parallel with the sacrament of Reconciliation becomes ever more clear. He has examined his conscience quite profoundly which leads him back to the Jirga meeting, which is his confessional. He is sorry for what he has done but this is not enough. He needs to confess aloud, to acknowledge his sin. He certainly has a firm purpose of amendment. A non-religious audience would appreciate the humane themes in Jirga, while the Christian audience, especially those with a sacramental tradition, would appreciate how the pattern of penance and reconciliation is played out before their eyes. Jirga: Starring Sam Smith, Sher Alam Miskeen Ustad. Directed by Benjamin Gilmour. 78 minutes. Rated M (Mature themes).